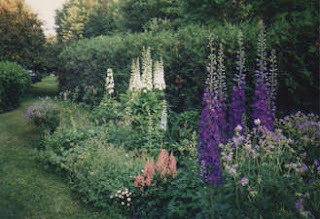 Elisabeth Tova Bailey lives on the mid-coast of Maine and that is about all we know of her background except that "At the age of thirty-four, on a brief trip to Europe, I was felled by a mysterious viral or bacterial pathogen, resulting in severe neurological symptoms" that began to slowly eat away at her immune system, severely compromise her heart rate, blood pressure, and digestion, and, for a time, more or less turn her bones to mush. She had to move to a studio and basically lie in bed all day and after awhile often the only person she would see was her caretaker for a half-hour at meals. Then a friend brought her a little pot of violets, dug from the leafy loam outside Elisabeth's studio, in which the friend had placed a single woodland snail. And this small humble snail ended up becoming Elisabeth’s companion, guide, and in a sense alter ego for a year. She moved the snail to a terrarium and made it a water dish out of the shell of a blue mussel. She boned up on snail nutrition and began feeding it pieces of portobello mushroom. She observed the snail (which, thankfully, she refrained from naming) closely, read botanical and biological tomes, pored through philosophy, haiku, memoir and early 1900's hygeine gazettes looking for references to snails. She discovered all kinds of fascinating facts about snails. Her snail possessed 2,640 teeth that, as Aristotle noted, were "sharp, and small, and delicate." "The teeth point inward so as to give the snail a firm grasp on its food; with about 33 teeth per row and maybe eighty or so rows, they form a multitoothed ribbon called a radula, which works much like a rasp. This explained my snail's nodding head as it grated away at a mushroom; it also explained the odd squareness of the holes I had discovered in my envelopes and lists." 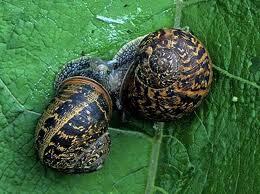 Snails can build a little door for themselves out of mucous and snugly shut themselves in for the winter. They have an elaborate and even seemingly tender mating ritual which in certain species involves, I kid you not, the mutual manufacture and launching of “tiny, beautifully made arrows of calcium carbonate” which are stored in a kind of built-in quiver. One of my favorite chapters was the one entitled "Marvelous Spirals." "Even when my snail was asleep, I loved to gaze at the beautiful spiral of its shell. It was a tiny, brilliant accomplishment of architecture, and because the radius of the spiral increases exponentially as it progresses, it fits the definition of a logarithmic or an equiangular spiral. Also known as the marvelous spiral"... She notes the many similarities between her and her snail: the pace at which they move; the way they're both having to adapt to changed environments. As the book progressed, I was afraid the snail would die: instead, it laid several clutches of eggs (snails are hermaphroditic, with a gestation period of 6-8 months) and gave birth to 118 baby snails. After a year, Elisabeth returned the snail to the woods, along with 117 of its children. Then she brought a single offspring snail back to her farmhouse, where her health continued to incrementally improve ("I might retrieve some papers from a few yards away in the late morning, and then in late afternoon I'd try a rash trip around the corner to the kitchen for a fresh glass of water"). She eventually released that snail as well and, we are given to understand, went on to study, ponder, and write this small gem of a book. We may know little of Elisabeth's background but we come to know a great deal about her largeness of soul. She retained her sense of humor through what must have been almost unimaginable suffering and stress. She is utterly devoid of self-pity, which, under the circumstances, seems at least as marvelous as an equiangular spiral. 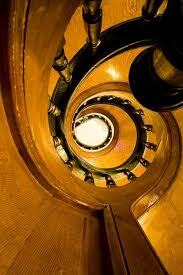 All that talk of spirals somehow reminded of Santa Fe's Loretto Chapel and the "Miraculous Staircase" which, constructed (inexplicably) of non-native wood, and without a single nail--only hand-carved wooden pegs--makes two complete 360-degree turns with no visible means of support. In 1878, the story goes, the cash-poor nuns, realizing the planned stairs to the choir loft of the new chapel weren't going to fit, made a novena to St. Joseph. Within days, an anonymous carpenter had ridden up on a donkey. Using only a saw, a hammer, and a square, over a period of six months he built the wondrous spiral staircase, then refused all payment and disappeared, never to be seen again. Like the anonymous carpenter, Elisabeth Tova Bailey worked with the simplest of tools: her wits and her questing spirit. Like the anonymous carpenter, she disappeared into the background--allowing the lowly but splendid snail to take center stage--and built a lasting monument to goodness, beauty, and truth. The Sound of a Wild Snail Eating restores your faith, just in case it was faintly wavering, in publishing...and the miraculous power of prose...and life. I've seen a gorilla eat snails(they do this rarely, but they do it) & that was a pretty religious experience for me. Or the closest I will come to a religious experience. It does sound like an inspiring book. story Heather. Thank you for sharing it. I was very moved by this story and want to read the book. Thanks for posting it. Heather, I reached out to you after reading "Redeemed." We exchanged a few emails and I enjoyed that. And now, a friend pointed out your blog, and I'm glad to be a reader. I'm still working on finding a home for my memoir -- have not tried as hard as I might. Raising five children has been a bit of an obstacle. :) But I'm feeling renewed energy for pushing forward with it. And this memoir sounds like one that will inspire me further. Thanks for the mention of it! 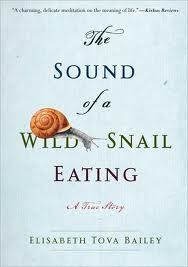 It really is a wonderful book, folks: if you've never much thought about snails before, you will after reading it! Roxane-I can see how raising five kids could seriously cut into a gal's writing time!...I'm glad you're pushing on with your memoir. FYI, if you or any of your fellow writers need help shaping, editing, etc., check out the new "Mentor" page on my website: heather-king.com. I bought this book last night (on Amazon kindle for PC) and I love it! I want a snail! So far, it is a wonderful book. I join Heather in recommending it.